After 12 years of negotiations, Iran was able to ink an agreement with the world's powerful nations to end harsh regimes of sanctions, some of which go as far back as 35 years ago. The document, now known as the Joint Comprehensive Plan of Action (JCPOA), is substantively extensive and qualitatively meticulous. It reveals for the first time the deep sanctions, restrictions, and isolation imposed on Iran since the establishment of the Islamic Republic in 1979. It also reveals the limited nature of the nuclear program Iran has built. Ultimately, this agreement has become more about legitimizing Iran's political order and less about nuclear weapons. Iran, after years of isolation, emerges as a regional power in a region in dire need for stability. This document shows that Iran leveraged a bomb it did not have to relieve itself of sanctions it did not deserve. Comprehensive Plan of Action (JCPOA), which will ensure that Iran’s nuclear programme will be exclusively peaceful, and mark a fundamental shift in their approach to this issue. They anticipate that full implementation of this JCPOA will positively contribute to regional and international peace and security. Iran reaffirms that under no circumstances will Iran ever seek, develop or acquire any nuclear weapons. exclusively peaceful purposes, consistent with international non-proliferation norms. programme, including enrichment activities and R&D. The JCPOA addresses the E3/EU+3’s concerns, including through comprehensive measures providing for transparency and verification. (JCPOA). 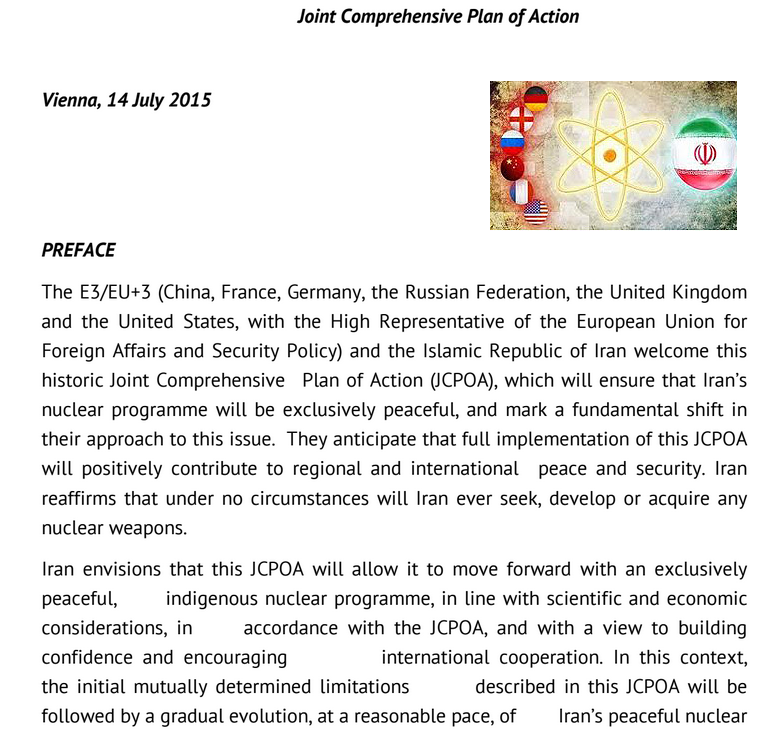 This JCPOA, reflecting a step-by-step approach, includes the reciprocal commitments as laid down in this document and the annexes hereto and is to be endorsed by the United Nations (UN) Security Council. ii. The full implementation of this JCPOA will ensure the exclusively peaceful nature of Iran's nuclear programme. iii. Iran reaffirms that under no circumstances will Iran ever seek, develop or acquire any nuclear weapons. iv. Successful implementation of this JCPOA will enable Iran to fully enjoy its right to nuclear energy for peaceful purposes under the relevant articles of the nuclear Non-Proliferation Treaty (NPT) in line with its obligations therein, and the Iranian nuclear programme will be treated in the same manner as that of any other non-nuclear-weapon state party to the NPT. v. This JCPOA will produce the comprehensive lifting of all UN Security Council sanctions as well as multilateral and national sanctions related to Iran’s nuclear programme, including steps on access in areas of trade, technology, finance and energy. vi. The E3/EU+3 and Iran reaffirm their commitment to the purposes and principles of the United Nations as set out in the UN Charter. vii. The E3/EU+3 and Iran acknowledge that the NPT remains the cornerstone of the nuclear non-proliferation regime and the essential foundation for the pursuit of nuclear disarmament and for the peaceful uses of nuclear energy. ix. A Joint Commission consisting of the E3/EU+3 and Iran will be established to monitor the implementation of this JCPOA and will carry out the functions provided for in this JCPOA. This Joint Commission will address issues arising from the implementation of this JCPOA and will operate in accordance with the provisions as detailed in the relevant annex. x. The International Atomic Energy Agency (IAEA) will be requested to monitor and verify the voluntary nuclear-related measures as detailed in this JCPOA. The IAEA will be requested to provide regular updates to the Board of Governors, and as provided for in this JCPOA, to the UN Security Council. All relevant rules and regulations of the IAEA with regard to the protection of information will be fully observed by all parties involved. xi. 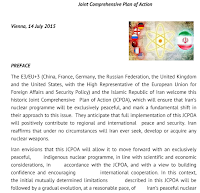 All provisions and measures contained in this JCPOA are only for the purpose of its implementation between E3/EU+3 and Iran and should not be considered as setting precedents for any other state or for fundamental principles of international law and the rights and obligations under the NPT and other relevant instruments, as well as for internationally recognised principles and practices. xii. Technical details of the implementation of this JCPOA are dealt with in the annexes to this document. xiii. The EU and E3+3 countries and Iran, in the framework of the JCPOA, will cooperate, as appropriate, in the field of peaceful uses of nuclear energy and engage in mutually determined civil nuclear cooperation projects as detailed in Annex III, including through IAEA involvement. xiv. The E3+3 will submit a draft resolution to the UN Security Council endorsing this JCPOA affirming that conclusion of this JCPOA marks a fundamental shift in its consideration of this issue and expressing its desire to build a new relationship with Iran. This UN Security Council resolution will also provide for the termination on Implementation Day of provisions imposed under previous resolutions; establishment of specific restrictions; and conclusion of consideration of the Iran nuclear issue by the UN Security Council 10 years after the Adoption Day. xv. The provisions stipulated in this JCPOA will be implemented for their respective durations as set forth below and detailed in the annexes. xvi. The E3/EU+3 and Iran will meet at the ministerial level every 2 years, or earlier if needed, in order to review and assess progress and to adopt appropriate decisions by consensus.